We seem to think of gardening primarily for summer flowers, but there are other seasons and attractions to consider: fall, winter, spring – and birds. 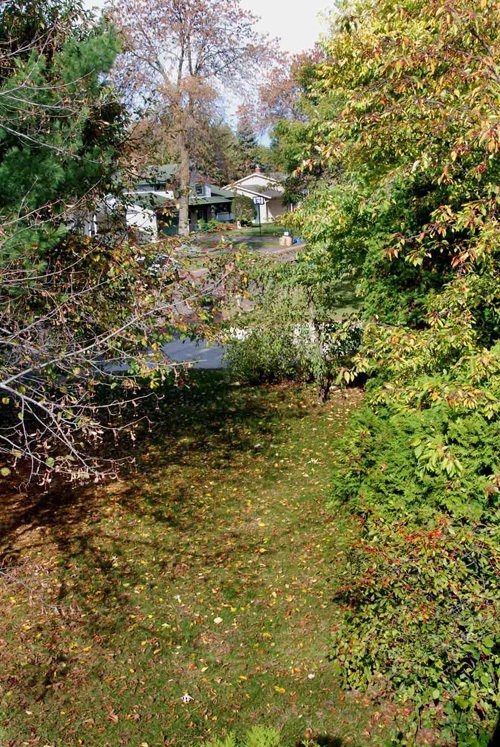 When we moved into our house 29 years ago, the yard offered green grass and little else. There were some birds but few places for them to perch, hide, or snack. We put up an addition to our house and placed shrubs and small trees around it, thinking more of our new windows and how the plantings looked. We did choose bushes and small trees that were reputed to provide fruit for birds. As the vegetation grew, the number of birds increased. Because we have no woods or fields nearby – only other yards – our variety of birds is limited but overall, there are many more birds and bird species than when we arrived. And because shrubbery is so near our windows, it is easy to take pictures of our avian visitors. We have pure sand – not soil – so plants that do well must be tough. This shrubbery adds to the appearance of our house, fills out the yard, and provides scaffolding to make snows picturesque. Non-summer has become more lively thanks to our woody plants. Crabapples, in my opinion, are our best flowering trees. I have grown Siberian crabapples from seed and they must essentially be our flowering crabs: They clearly cross-pollinate and produce seedlings. I planted one seedling 20 years ago that has small red fruit the birds clean out in the late fall. 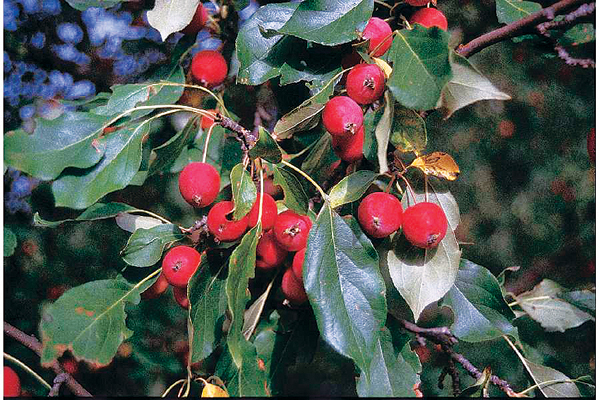 I bought a grafted weeping “Red Jade” crabapple about 10 years ago, planting it in a strategic spot 8 feet from a window. It produced larger fruit from a young age and has been a real bird Mecca. I also grafted two ornamental crab varieties onto dwarfing apple rootstock, putting them in front of another window. They have still larger fruit that birds often don’t take until spring. 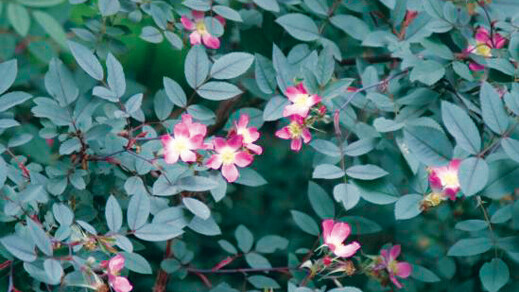 I planted this one because of its relatively small thorns, it reddish leaves and canes, and its rugged constitution. Birds will pick at its rose hips all year, but it is a good tangle where birds can perch and wait for our thistle feeder. The flowers aren’t that showy but the dusky red foliage is a nice backstop to a flowerbed. 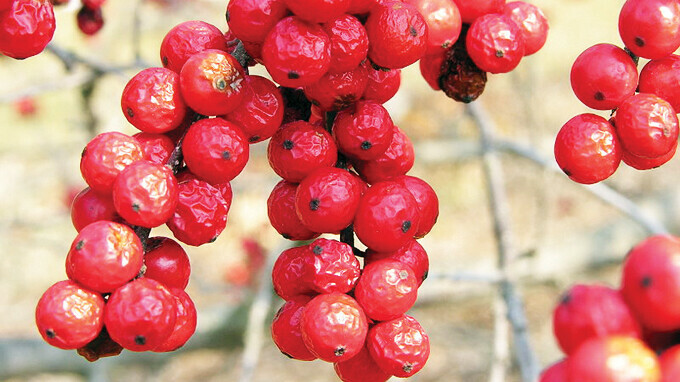 It produces fruit copiously in early summer – edible both to birds and humans. This is a good bird shrub because branches give decent bird cover all year. Serviceberries seem to like sand: They are a common plant in the Pine Barrens area of Northwestern Wisconsin. They spread slowly but can be controlled easily with the occasional use of a grub hoe. This is a small tree or large bush I’ve found in my woods in western Wisconsin – in fact, I dug them up for my yard. They are hardy even in our sand, provide good perches and some cover for birds, have a wonderful multi-tiered succession of branches, offer some berries for birds, and don’t get that big. I hang suet feeder from them. 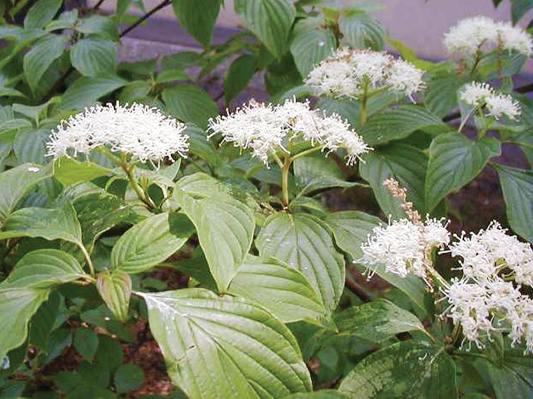 This is a native plant I used to see in wet semi-shaded areas in Northern Minnesota where I used to hunt. Both male and female plants are required for the female plant to produce fruit. 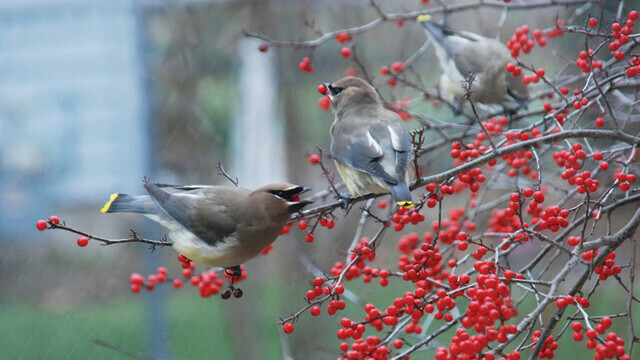 It has small bright-red fruit that cedar waxwings in particular will gang up on in late fall and strip. 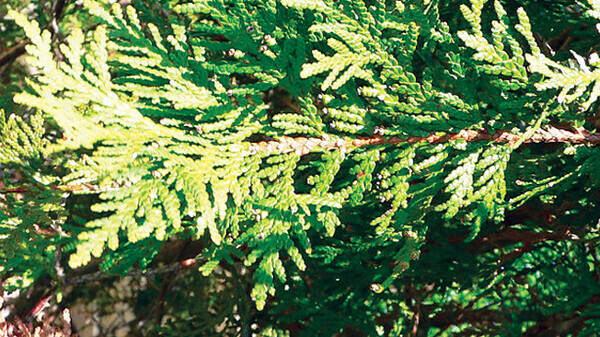 These evergreens come in different shapes and sizes – some are called pyramidal or globe arborvitae. They have cones and produce seed – which birds will eat – but their principle virtues is the splendid cover they give summer and winter. Some selections stay small, but the regular version – unless pruned regularly – becomes a big tree. They are shrubs that came with our house that I’ve retained. Our main birdfeeder is a few feet from several white cedars where desperate birds can dash into the greenery if a Cooper’s hawk or other bird-eater swoops in. Now for a plug for brushy yards: People have described my yard as looking like an English garden. Although this is not accurate, I think what they’re seeing is the wild, lush, twiggy look of good-sized shrubs. I wish more people would plant for birds instead of obsessing over grass. Bird feeders seem the primary bird draw, but to enhance them, bush support is a must. Twiggy tangles should be fashionable. I’m sure the birds would agree. About the Writer: Conrad Leighton grows apples at his Dunn County orchard and gardens at his home in the suburban Twin Cities.